On the outside, Rachel Young seems like the typical private school rich girl. But on the inside she hides a girl who loves cars more than makeup and racing more than shopping. Rachel keeps her real personality a secret from her parents and brothers, and lets the real Rachel run free when she sneaks out at night to drive her Mustang. When she gets in over her head with a street race, Isaiah Walker helps her out. He is exactly the type of boy her parents would never want her to be involved with–foster kid, tattooed, into street racing–yet she can’t seem to stop thinking about him. When their lives are threatened after a street race and they are given six weeks to set things right, Isaiah and Rachel must work together to save each other. I love these books!! It’s so great to be able to read a new story about a character we’ve seen in previous books, and I love how we still get to see what characters like Noah and Echo and Beth are up to. I felt so bad for Isaiah after what happened in Dare You To, and I was so excited to read his story. Isaiah and Rachel are more similar than they initially think. They both present a certain image on the outside, but in reality they are very different on the inside. Isaiah presents the bad boy look so that other people won’t mess with him, but he is actually trying very hard to do well in school so that he can pass his automotive test and get a good job straight out of high school. Rachel forces herself to act the way her mother would want her to, but it hurts her to be unable to share her true self with her family. The two are able to be their true selves with each other, and they realize that they have more in common than just their love for cars. I really liked Rachel because she was such an innocent young girl who was completely inexperienced in relationships, and it was fun to see how nervous and excited she became when she got involved with Isaiah. It was also interesting to see how transformed she became when she was behind the wheel of a car. She also has to deal with so many things in secret and it was horrible how sick it made her. Her family was extremely messed up, and didn’t even notice what was happening to Rachel right in front of them. Isaiah was able to give her a sense of freedom from her family, and he helped her realize that she is just as important as the rest of her family and she should not hide herself or do things she doesn’t want to do just to make other people happy. Overall, Crash Into You was an exciting story with great new characters and a beautiful love story. My favorite new character was definitely Abby and I’m hoping that McGarry will write a story about her one day! 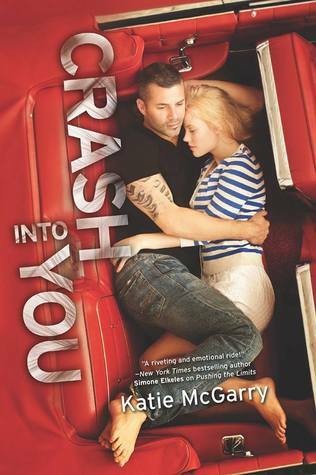 Crash Into You was released today, November 26, 2013 and is the third book in the Pushing the Limits series.